But why do we want to know his answer? It’s simple. He’s the one who had the idea of producing this COLLECTION in the first place: A tribute to nature. It’s the subject of this COLLECTION and his work. Asaf Sabag is Berliner-by-choice. Born in Jerusalem he is now living in Berlin for about two years, following his passion: “ I love to work and to play with wood.” That’s why this special interest plays an important role in his life. Becoming one with nature — a wish that a lot of people have these days. Putting the natural before the artificial and translating naturalness into art. Similar to the period of Art Deco in the 1920s. Anyhow, one thing is clear: Nature experiences its renaissance and forms the basis of almost every artwork nowadays. Still, today we handle the impact of nature a bit differently. “Nothing else gives you such direct feedback and creates such a direct connection between an artwork and its creator than wood,” says Asaf in our interview. Rough, harsh and unadorned – that’s how he loves to carry out nature; in his case wood. The results are wonderful, natural woodwork from tables to paneling – all of them pure and authentic. With this series we want to pay tribute to exactly those works. Together with a very exciting female protagonist who isn’t any less nature-loving: Magic Island. She is a producer, singer and songwriter and has been a part of Berlin’s music scene for some years. Magic Island was raised in Canada and then spent some time in Poland before she moved to Germany. Today she charms the usually so dark city with her ethereal beauty, while seducing it with her elfish tunes. And just like that she captures the legendary Berlin nights. For BIRD'S NEVER BORED she now stepped in front of Yuval Itzhaki‘s camera. Yuval is a talented engineering student from Tel Aviv with a special passion for photography. Asaf Sabag is the one who brought him on board for making this COLLECTION. Together we wanted to translate nature into action and Magic Island should represent all the pure beauty nature has to offer. In this spirit, we invite you to join our journey and get to know the world of today’s nature — the nature of creators and their environment. A world full of strength and gentleness. “I wish people would listen more to nature and thus more to themselves,” with those words Asaf fascinates us once again as he starts talking about his love of nature and wood. Nature is his biggest source of inspiration, and undoubtedly this is also true for many others. Today nature is more present than ever. Organic designs celebrate their golden age. Jewelry creations like the ones from Vibe Harsløf are literally embodying this tendency. Instead of only classic creations he focuses more on body-jewelry. Pieces of jewelry that overgrow the body like spiraling blossoms. Kimono for € 820,–, bikini with high waist trousers for € 328,–, all by Tatjana Anika | Necklace with pearl for € 325,– by Vibe Harsløf | Nail polish „BOO - bodo“ by USLU AIRLINES for € 19,– | „Diorskin Forever Fluid Foundation“ Nr. 022 Camée for € 49,–, lipgloss „Dior Addict Milky Tint“ Nr. 156 Milky Pastel for € 35,50, eyeliner „Dior Addict It-Line“ Nr. 959 It-Lilac for € 34,–, „Diorblush Sculpt Professional Contouring Powder Blush“ Nr. 003 Beige Contour for € 45,–, all by DIOR | „Strobe Cream Hydratant Lumineux“ for € 35,50, „Mineralize Skinfinish Global Glow“ powder for € 32,–, „Pigment TAN“ for € 23,–, „Studio EyeGloss“ in Lightly Tauped and Pearl Varnish each for € 24,–, all by M.A.C. COSMETICS | „Detox Face Oil“ for € 70,–, „Face and Body Shine“ for € 60,–, all by TROMBORG | Styling-finish „Mascobadogel“ (150ml) for € 27,– by LESS IS MORE. After all, also the manufacturing process is influenced by nature. The motto “back to craftsmanship” is just something that comes out of the predominating DIY hype (editor’s note: Do it yourself). People prefer to produce everything in their own atelier — just like Asaf does in Berlin or Magic Island in her own recording studio. Artificial might be the result, but only after it has been nurtured by the designer or another creative. In fact though, it is more about staying true to your own biorhythm and following and fulfilling your own values and concepts of (natural) beauty. 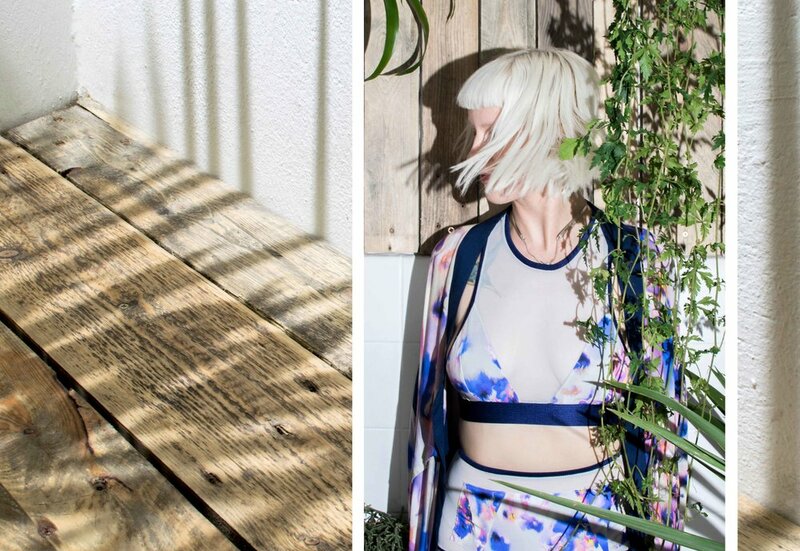 Kimono for € 820,–, bikini with high waist trousers for € 328,–, all from Tatjana Anika | Hand jewelry (cuffs and Co.) by Vibe Harsløf from € 215,– up to € 255,–. Made out of Sterling Silver or Sterling Silver 24 KT gold plated | nail polish „BOO - bodo“ by USLU AIRLINES for € 19,– | „Diorskin Forever Fluid Foundation“ Nr. 022 Camée for € 49,–, lipgloss „Dior Addict Milky Tint“ Nr. 156 Milky Pastel for € 35,50, eyeliner „Dior Addict It-Line“ Nr. 959 It-Lilac for € 34,–, „Diorblush Sculpt Professional Contouring Powder Blush“ Nr. 003 Beige Contour for € 45,–, all by DIOR | „Strobe Cream Hydratant Lumineux“ for € 35,50, „Mineralize Skinfinish Global Glow“ powder for € 32,–, „Pigment TAN“ for € 23,–, „Studio EyeGloss“ in Lightly Tauped and Pearl Varnish each for € 24,–, all by M.A.C. COSMETICS | „Detox Face Oil“ for € 70,–, „Face and Body Shine“ for € 60,–, all by TROMBORG | Styling-finish „Mascobadogel“ (150ml) for € 27,– by LESS IS MORE. For Magic Island the universe, the cosmos, is the biggest treasure of nature. For Asaf it is wood and Yuval is by nothing else more inspired than the sky, and using the power of light for his photography. However, also in urban areas nature is becoming more and more important: City gardening is bigger than ever. It is your private city jungle where you are surrounded by plants that let you breathe again that make you feel most comfortable and at home – just like back in the days when a tree represented not only a creature of nature, but also a place for a home, a perfect place for a tree house. It seems as if we were craving for nature and naturalness more than ever. Kimono for € 820,– by Tatjana Anika | Footlets and anklets wit pearls and without by Vibe Harsløf from € 198,– up to € 232,–. Made out of Sterling Silver or Sterling Silver 24 KT gold plated | nail polish „BOO - bodo“ by USLU AIRLINES for € 19,– | „Diorskin Forever Fluid Foundation“ Nr. 022 Camée for € 49,–, lipgloss „Dior Addict Milky Tint“ Nr. 156 Milky Pastel for € 35,50, eyeliner „Dior Addict It-Line“ Nr. 959 It-Lilac for € 34,–, „Diorblush Sculpt Professional Contouring Powder Blush“ Nr. 003 Beige Contour for € 45,–, all by DIOR | „Strobe Cream Hydratant Lumineux“ for € 35,50, „Mineralize Skinfinish Global Glow“ powder for € 32,–, „Pigment TAN“ for € 23,–, „Studio EyeGloss“ in Lightly Tauped and Pearl Varnish each for € 24,–, all by M.A.C. COSMETICS | „Detox Face Oil“ for € 70,–, „Face and Body Shine“ for € 60,–, all by TROMBORG | Styling-finish „Mascobadogel“ (150ml) for € 27,– by LESS IS MORE. If on the menu of popular restaurants where you find more “organic” than simple ingredients, or in the interior design industry — “all natural” appears to be the biggest trend. Old botanical drawings are now being used as wallpapers, pictures or prints and also in the cosmetic industry you find all kinds of natural tools such as coconut oil or mineralizing thermal water instead of synthesized “miracle cures”. Kimono for about € 800,–, white swim suit for € 338,–, all by Tatjana Anika | Golden earwrap with pearls by Vibe Harsløf for € 130,– | nail polish „BOO - bodo“ by USLU AIRLINES for € 19,– | „Diorskin Forever Fluid Foundation“ Nr. 022 Camée for € 49,–, lipgloss „Dior Addict Milky Tint“ Nr. 156 Milky Pastel for € 35,50, eyeliner „Dior Addict It-Line“ Nr. 959 It-Lilac for € 34,–, „Diorblush Sculpt Professional Contouring Powder Blush“ Nr. 003 Beige Contour for € 45,–, all by DIOR | „Strobe Cream Hydratant Lumineux“ for € 35,50, „Mineralize Skinfinish Global Glow“ powder for € 32,–, „Pigment TAN“ for € 23,–, „Studio EyeGloss“ in Lightly Tauped and Pearl Varnish each for € 24,–, all by M.A.C. COSMETICS | „Detox Face Oil“ for € 70,–, „Face and Body Shine“ for € 60,–, all by TROMBORG | Styling-finish „Mascobadogel“ (150ml) for € 27,– by LESS IS MORE. And the hype towards nature continues up to the fashion industry with its big fashion houses where all of a sudden well established motives like the bee, which already deposed the French lily majestically from its throne in the 19th century, are yet again becoming popular. Botany as a state-of-the-art. If at GUCCI, VALENTINO, PRADA or COMME DES GARÇONS: Nature is the (design-)credo of the present time. Just like Asaf Sabag who dedicates himself with his studio WOODENheART to wood; the musician Magic Islandwhose new album “Like Water” will be released in January 2017, or the precession of light that excites the photographer Yuval so much. Nature is everywhere and it is a part of us. Kimono for about € 800,–, white and blue patterned swim suit for € 408,–, all by Tatjana Anika | watch „GUCCI G-Timeless Bee“, Small, steel/gold PVD coated and with leather strap for € 750,– by GUCCI Timeless | nail polish „BOO - bodo“ by USLU AIRLINES for € 19,– | „Diorskin Forever Fluid Foundation“ Nr. 022 Camée for € 49,–, lipgloss „Dior Addict Milky Tint“ Nr. 156 Milky Pastel for € 35,50, eyeliner „Dior Addict It-Line“ Nr. 959 It-Lilac for € 34,–, „Diorblush Sculpt Professional Contouring Powder Blush“ Nr. 003 Beige Contour for € 45,–, all by DIOR | „Strobe Cream Hydratant Lumineux“ for € 35,50, „Mineralize Skinfinish Global Glow“ powder for € 32,–, „Pigment TAN“ for € 23,–, „Studio EyeGloss“ in Lightly Tauped and Pearl Varnish each for € 24,–, all by M.A.C. COSMETICS | „Detox Face Oil“ for € 70,–, „Face and Body Shine“ for € 60,–, all by TROMBORG | Styling-finish „Mascobadogel“ (150ml) for € 27,– by LESS IS MORE.